My name has been misspelled several times throughout my entire life. In fact, it’s probably one of the simplest names to spell, right? It doesn’t even contain any tongue-twisting pronunciation or funky syllable like abcde. So I always had this thought… so hard to spell my name meh? What the hell?! Dear Can?! 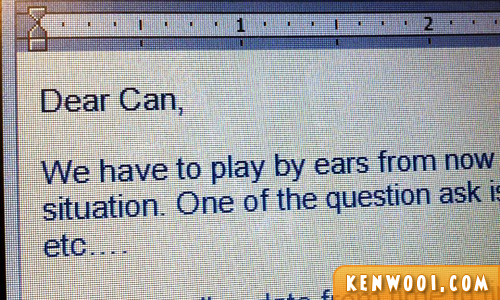 Yes, I know I always can… but my name is Ken, please… pfft! Hahahha. this got me laughing! Hi Ken! i was reading my old posts and saw u in one of old comments.. clicked and yay, you are still actively blogging!! good good.